I’ll be leading a study group at HILR this fall called “The Fruits of Monotheism” which asserts that the adoption of monotheism and personal piety in the three centuries following the Exile led more-or-less directly to the introduction into Jewish apocalypticism of the ideas of Satan, heaven and hell, an immortal soul, and resurrection. The course website with a longer description is here. In the process I hope to write an article for a general interest audience (e.g., the Atlantic, New York Review of Books). I’ll also be recording for release online the Harvard undergraduate General Education course “The Elements of Rhetoric” taught for many years by James Engell. Now that I can satisfactory use an iPhone as a video camera, I hope to overcome the challenges of including multiple camera angles on the lecturer and capturing student responses to questions; it’s a very interactive course. Deb and I hope to continue our tradition of blogging our summer Vespa touring. We start with five weeks in the Netherlands and Belgium (with a dip into Germany). We then try to blend into a New York Times tour based in Aix-en-Provence about opera led by Fred Plotkin, who led an Oldways tour of Liguria we took at least 15 years ago; we’ve reserved at the headquarters hotel and purchased tickets to each of the operas. August will be more relaxed, mostly at the villa. I’ve just finished leading a study group called “The Golden Age of Rock and Roll” covering the years 1953-1963. This has given me an excuse to read a lot more about Elvis, Sam Phillips, Little Richard, Chuck Berry and the rest of the gang. I’ve also gotten to listen to a lot of the music again. [course website]. And before that: “An Intellectual History of Judaism and Christianity” [course website] gave me an chance to consolidate a great deal of scattered reading about the biblical period. 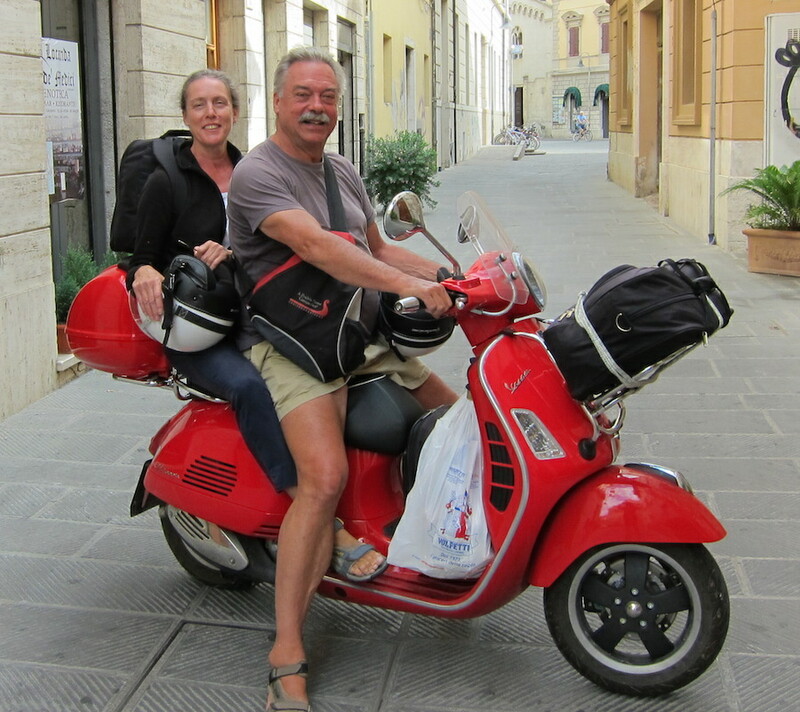 Deb and I have spent the past seven summers touring Europe on our 300cc Vespa. (scroll down for photo). 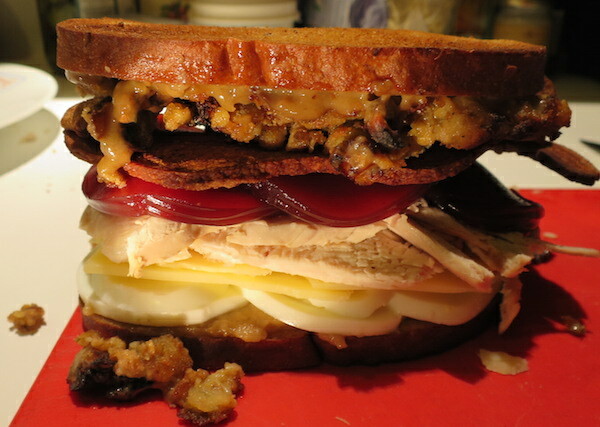 Here's the famous Ruml turkey sandwich, developed over many years. Reading from the bottom: Pepperidge Farm Seeded Rye lightly toasted, gravy, hard-boiled egg slices, emmenthal cheese, turkey white meat, cranberry jelly, ultra-crisp thick bacon, dressing, gravy, toast. I'm a hugh fan of olive bread, but nothing I can buy has enough olives (I guess the olives are a lot more expensive than flour). 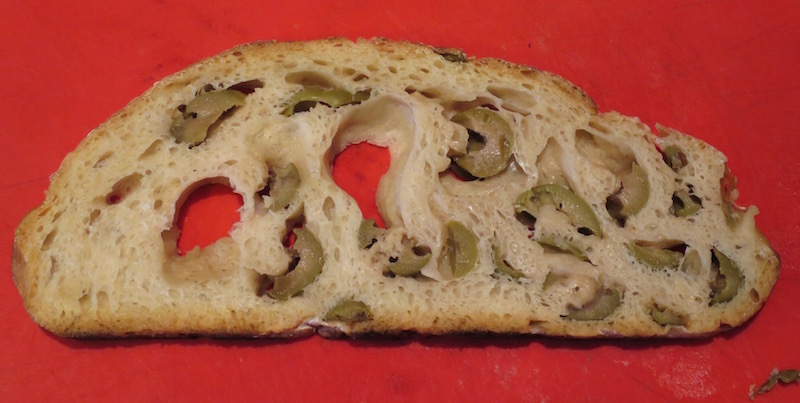 The solution has been to use Jim Lahey's no-knead bread recipe with about 3 cups of chopped olives to make the ideal loaf. 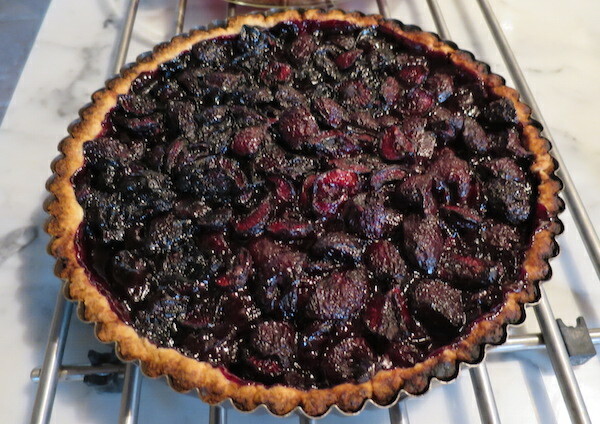 This is the tart we make at the villa during cherry season. Exactly the same recipe as for our classic blueberry tart; the cherries come from the nearby town of Vignola, considered the best source for cherries in Italy. We're in Grossetto, returning to the villa from our eight weeks (5000km) in Greece in 2011, fortified with provisions from Volpetti (the Dean and Deluca of Rome).